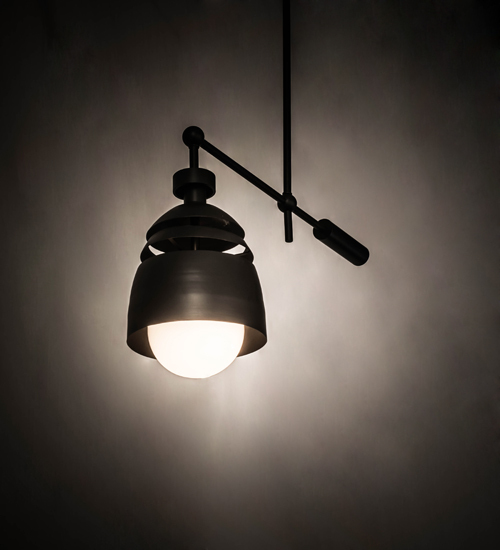 Description: A unique aluminum shade with a cutaway profile reveals a contemporary, industrial style featuring a Matte Black finish on the exterior and an Antique Copper finished interior for exceptional aesthetics. A counterbalanced arm suspended from the ceiling support helps deliver ambient illumination from a White Glass globe lamp. The arm and additional hardware are featured in a Matte Black finish. Custom designs, sizes and finishes are offered, including dimmable energy efficient lamping such as LED. This fixture is UL and cUL listed for damp and dry locations.